When I saw the tweet about experiencing the end stage of champagne making at Weltevrede Wine Estate I immediately signed up and paid the money for Dave and I to attend. I could not wait for 16h00 to arrive on the Saturday afternoon as if there is one thing I love drinking more than anything else, it is champagne. Now here in South Africa we are not allowed to call it champagne, we refer to it as MCC – Methode Cap Classique. Our MCC’s are amongst the finest in the world and I am quite partial to a bottle or two with no excuse of a celebration needed. MCC or champagne refers to when bubbles are created by fermentation in the bottle. We arrived a little bit early and started our afternoon with a taste of the Weltevrede Philip Jonker Brut Entheos NV (R86/bottle). Philip is the 4th generation wine maker at Weltevrede. We were warmly greeted by Steyn before moving in to the room where we would be ‘making’ our MCC. Before we got to the end stage of the MCC process, we were shown an audio visual presentation that highlighted the 5 year journey our bottles had been on. The presentation showcased the terroir of Weltevrede. In this climate chardonnay thrives in their valley of shale rock. Phillip believes in working with nature and he prunes his vines in winter as soon as they experience the first frost. This encourages the spring growth and you can see just how close to nature they are by the number of ladybirds in the vineyards. The grapes are harvested in summer and our bottles were from the 2007 harvest. Once the grapes have been picked they are sent to the bins for pressing. The contact between the skins and grape juice is what gives the wine its colour. The grapes are then turned into a base wine which has its primary fermentation in stainless steel tanks and oak barrels. The second fermentation starts with bottling the base wine and adding 24mg of sugar and yeast. A crown cap is placed onto the bottle which will be removed after the bubbles have formed. It is the reaction of the yeast and the sugar which creates the bubbles and the bottles are under 1 bar of pressure for each 4gm of sugar added to the base wine. After a month the yeast dies and the fermentation process continues. These MCC bottles are stored underground for 5 years and you can see these cellars first hand if you choose to do a cellar tasting. Before the crown cap can be removed and the corks placed on to the bottles, the bottles need to be turned in order to get the lees to settle. This is done by placing the bottles on a framed wooden rack and turning and tilting the bottles a quarter turn at a time until the lees are all in the neck of the bottle and lying on the crown cap. This is termed riddling and is done until the MCC is clear. 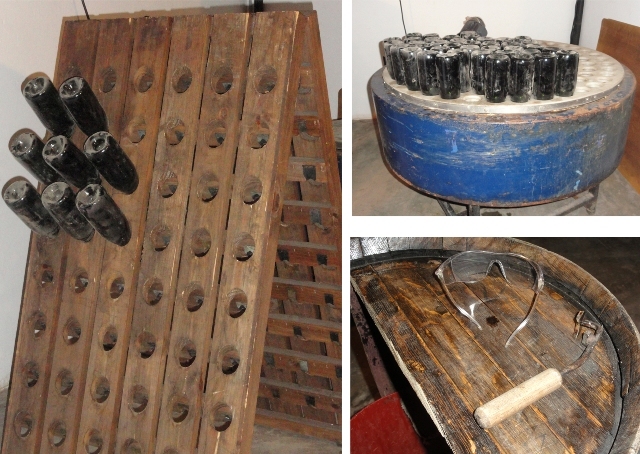 The bottles are then placed up side down into a freezing table and glycol is used to freeze the contents in the neck. This can be done without freezing the neck but you will lose more wine. The crown cap is then flicked off – similar to how you would open a bottle of beer and the pressure causes the lees to shoot out. At this stage, you might lose some of the MCC. The next stage is adding back the loss and is called dressage. This determines the ‘sweetness’ of the MCC and as we were making a Brut we added 10mls of a wine and sugar mix. 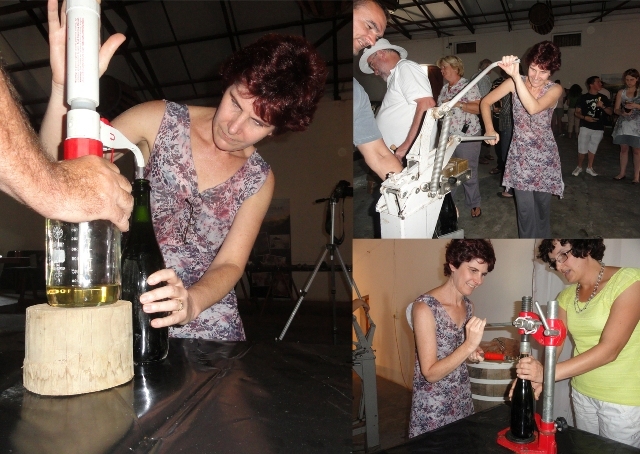 The bottles is then corked before adding the wire and foil and the last stage is labeling the bottle. Take a close look at the cork the next time you pop a bottle of bubbly – the mushroom shape of the cork indicates the amount of time the cork has been in the bottle given that it starts out cylindrical. The Weltevrede Philip Jonker Brut The Ring 2007 (R118/bottle) is 100% chardonnay and is a great buy but if you are like me and prefer a Rosé then do try the Weltevrede Philip Jonker Brut Lindelize Rosé NV (R103/bottle), which is named after Philip’s wife. Disclosure: Any errors describing the process contained in this post are my own. Nice information! 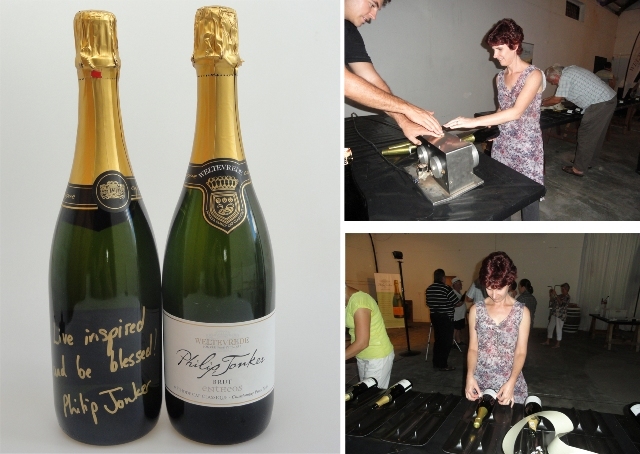 There is amazing about “‘Making’ Our Own Champagne At Weltevrede, Bonnievale”. I am impressed by the quality of information on this website. There are a lot of good resources here. I am sure I will visit this place again soon. MCC is also the title of the venerable Marylebone Cricket Club, but as I’ve never liked cricket, I’ll go for a glass of your delicious South African bubbly. Nice way to spend a day. Far better than cricket at least! It was so great to be able to take part in this! What fun and great photos! Sounds like a fun event to be part of. You go on some of the best adventures…looks like a blast! That looks like a terrific time Tandy. How’s that for alliteration? You will have to make your next overseas visit to here! How fun! I bet it tasted great. Wow Tandy, what an amazing experience that must have been! Wow How lucky. It must have been really exciting. It was so interesting and enjoyable! It is worth coming down here for next year’s event!